This report represents the Pew Internet & American Life Project’s first effort to see how cell phone users manage their personal mobile information. Our questions explored some steps they take to control who has access to that information (be that other individuals or third parties such as app makers), their efforts to protect their personal data and information from loss, as well as their experiences with cell phones that are lost or otherwise compromised by third parties. Taken together, 57% of all app users have either uninstalled an app over concerns about having to share their personal information, or declined to install an app in the first place for similar reasons. Outside of some modest demographic differences, app users of all stripes are equally engaged in these aspects of personal information management. Owners of both Android and iPhone devices are also equally likely to delete (or avoid entirely) cell phone apps due to concerns over their personal information. Even as cell owners take steps to maintain control over their personal data in the context of mobile phones, the physical devices themselves can occasionally fall into the wrong hands. 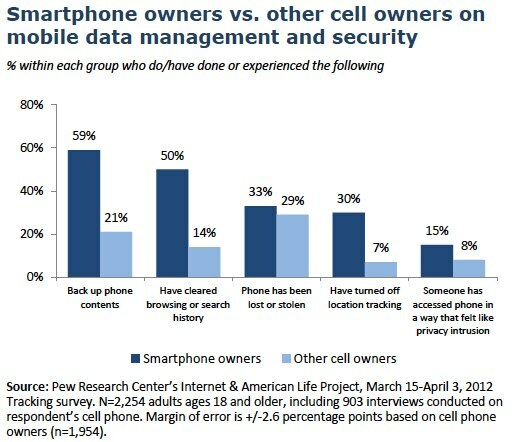 Some 31% of cell owners have lost their cell phone or had it stolen, while 12% of cell owners say that another person has accessed their phone’s contents in a way that made them feel that their privacy had been invaded. Despite the fact that backing up one’s phone is typically conducted as a safeguard in the event that the phone is lost or stolen, cell owners who have actually experienced a lost or stolen phone are no more likely than average to back up the contents of their phone. The youngest cell phone users (those ages 18-24) are especially likely to find themselves in each of these situations. Some 45% of cell owners in this age group say that their phone has been lost or stolen, and 24% say that someone else has accessed their phone in a way that compromised their privacy. Smartphone owners are especially vigilant when it comes to mobile data management. Six in ten smartphone owners say they back up the contents of their phone; half have cleared their phone’s search or browsing history; and one third say they have turned off their phone’s location tracking feature. Yet despite these steps, smartphone owners are also twice as likely as other cell owners to have experienced someone accessing their phone in a way that made them feel like their privacy had been invaded. Owners of smartphones and more basic phones are equally likely to say their phone has been lost or stolen. The results reported here come from a nationwide survey of 2,254 adults (age 18 and older) between March 15-April 3, 2012, including interviews on landline and cell phones and conducted in English and Spanish. The overall sample has a margin of error of plus or minus 2.4 percentage points. Some 1,954 cell users were interviewed in this sample and many of the results published here involve that subset of users. The margin of error for data involving cell users is plus or minus 2.6 percentage points.